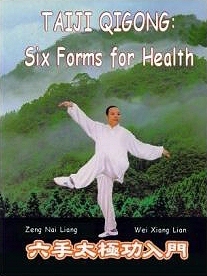 Taiji Qigong: Six Forms for Health, Zeng Nailiang & Wei Xianglian. 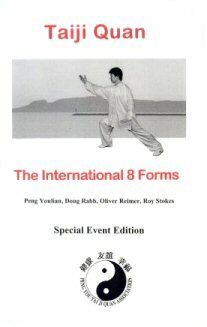 Taiji Quan: The International 8 Forms, Peng Youlian et al. When Grandmaster Zeng Nailiang, retired head coach of the Chinese National Wushu Team visited Canada, his host Master Peng You, President of the Peng You Taiji Quan Association, suggested developing a distinctive Canadian Taiji form, and thus was born TAIJI HOCKEY STICK, after Master Zeng was taken to a number of local hockey games. Dr. Doug Rabb, Taiji instructor and specialist in comparative philosophy was consultant on the English names and descriptions. Taiji Hockey Stick is based on Taiji weapons forms such as Taiji Staff and Taiji Spear. The purpose of this unique Taiji form is to bring Chinese and Canadian cultures closer together. Of course, you don’t have to be a hockey player to have fun learning and performing TAIJI HOCKEY STICK. 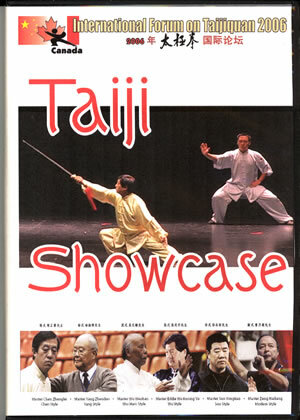 Now available – the entire program of performances of the Grandmasters at the Showcase of the Taiji Forum. Yang Family Style: Grandmaster Yang Zhenduo. Master Yang Jun and Master James Fu. Wu (Hao) Family: Grandmaster Wu Wenhan. Modern Style: Grandmaster Zeng Nailiang. Wu Family: Grandmaster Eddie Wu Kwong Yu & Grandmaster Ma Hailong. Sun Family: Grandmaster Sun Yongtian. Chen Family Style: Grandmaster Chen Zhenglei, Master Chen Bin & Master Jack Yan. Also the Erhu performance by Yang Ying and the Taiji Hockey performance of Masters of Ceremony, Peng You and Kevin Kennedy. 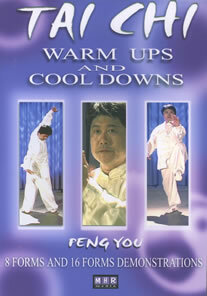 A new learning resource, Tai Chi Warm Ups and Cool Downs, which includes the 8 and 16 forms has just been released. Taiji practice at home can be better than ever because on this DVD Peng gives detailed instruction on how to “warm up” and “cool down” as well as demonstrations of the 8 and 16 forms with explanations for every movement of the 8 Forms. Taiji Qigong: Six Forms for Health. This teaching video begins with Master Wei Xianglian demonstrating the complete set of six forms. She repeats each form three times. In the next section,”detailed teaching”, Master Wei does the form once and Master Zeng gives a detailed explanation of how to move and breath. Finally, Master Peng performs the movements, inviting viewers to follow him. 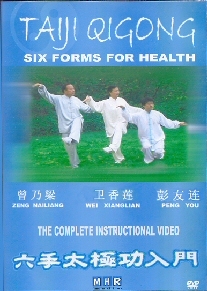 In addition, at the end of the video, you see Master Peng, demonstrating the seated version of Six Forms Taiji Qigong. Taiji Qigong: Six Forms for Health, Peng Youlian et al. 8.5 x 11 inches. Plastic comb binding to open flat.The six forms of this set combine the flowing coordinated movements of Taijiquan with the meditative concentration on Qi and deep breathing of Qigong. One can practice the whole set or just repeat a particular form to achieve the same health benefits. All it requires is a couple of square yards of floor space. The authors have created a form that can be learned in a relatively short time. Though easy to learn the Six Forms offers the benefits of increased strength, better balance and coordination and greater confidence in one’s physical and mental abilities. Once mastered it can become the bridge to other forms in Taiji Quan and Qigong. This edition is the first and only English translation of the book by the creators of the Form, Taiji masters, Zeng Nailiang and Wei Xianglian of Fuzhou, China. The translators/editors combine many years of experience practicing and teaching Taijiquan with fluency in Chinese and English, graphic arts skills, writing and editing skill and wide knowledge of the literature about Taiji and Qigong. Taiji Quan is an ancient Chinese martial art which is now practiced all over the world for its proven health benefits. Qigong is a form of meditative disciplined breathing derived from Traditional Chinese Medicine. Though all styles of Taiji quan incorporate some Qigong, the emphasis is usually on the martial arts or self-defence aspect of the discipline. When the “quan,” literally “fist,” is removed from Taiji Quan and replaced by “Qigong”, the health benefits of both Taiji and Qigong become paramount. We are convinced by the scientific studies that have been published thus far, by the massive amount of anecdotal evidence and by our own personal experience, that Six Forms Taiji Qigong can significantly improve the lives of individuals, and has the potential to save significant health-care dollars especially in countries with large aging populations. It is for these reasons that we encourage as much research as possible into the health benefits of Taiji Qigong. This is certainly one of the reasons we have undertaken to translate Masters Zeng and Wei’s, Taiji Qigong: Six Forms for Health into English. (From the Editors’ Introduction). This book was written and published specially for the 2003, Canada Day celebration of Taiji, in which more than 1000 people moved their bodies slowly and gracefully through the gestures of this short form of Taijiquan, in Thunder Bay’s Marina Park. It is well illustrated with simple, clear, step by step instructions. Photographs show Master Peng Youlian in the characteristic postures. Arrows show the next movement of hands and feet. 8.5 x 5.5 inches. Plastic comb binding to open flat.